I feel like this happens every year - we think we are out of the woods with winter and that spring is on our doorstep, when suddenly another big storm hits! I've been fooled a couple times this year already. This trend, unfortunately, is nothing new, and something that St. John's has been dealing with for decades. Newfoundlanders have become very adept at dealing with the harsh weather, and sometimes need to rely on back up plans for transportation when your regular vehicle just couldn't cut it. 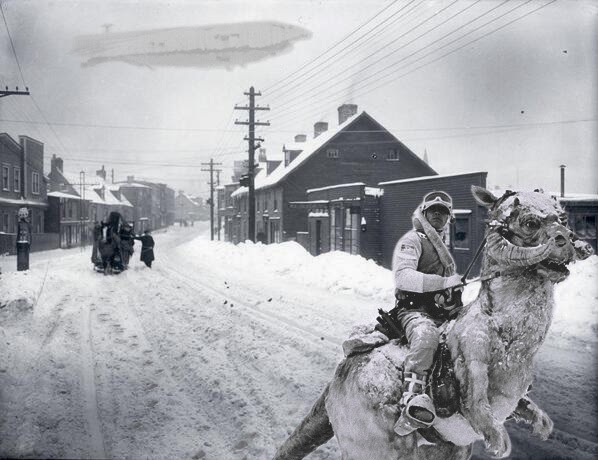 This weeks folklore photo is of New Gower Street from 1925 - and as you can see, even this young man riding on his trusty Tauntaun is having a tough time with the winter weather! Tauntauns were used as pack animals, and also served as patrol mounts when the Rebel Alliance's vehicles couldn't deal with the cold weather. I could have certainly used one this past winter!